Manhattan, NY Silverstein Properties, a full-service real estate development, investment and management firm, has opened NYC’s fifth-tallest tower, 3 World Trade Center. Commemorated by a ribbon-cutting ceremony held in the building’s lobby with the developer Larry Silverstein, government leaders and building tenants in attendance, the completion of the 80-story, 2.5 million s/f office building marks a milestone for the new World Trade Center, becoming the second-to-last tower to open on the 16-acre site. 3 WTC will welcome 6,000 new employees to Lower Manhattan this year, from tenants GroupM, McKinsey and IEX. “The new 3 World Trade Center is a soaring symbol of the revitalization of downtown New York City and a testament to the enduring spirit of New Yorkers after 9/11. 3 World Trade will be a hub of commercial activity and growth for the city and support our efforts to ensure New York remains the economic capital of the world,” said governor Andrew Cuomo. Located at 175 Greenwich St., 3 WTC was designed by Pritzker prize-winning architecture firm Rogers Stirk Harbour + Partners. Featuring a reinforced concrete core encased by a steel structure and defined by its load-sharing system of K-shaped bracing, the building has floor-to-ceiling glass and column-free floor plates, creating unobstructed 360-degree panoramic views of New York City. Other project team members include: Architect of record - Adamson Associates; construction manager - Tishman Construction Corp.; structural engineers - WSP USA; MEP engineers - Jaros Baum & Bolles; security consultant - Ducibella Venter & Santore Robert; and exterior wall consultant - Vidaris. With a total of 2.5 million s/f of office space, the 80-story tower will feature 30,000 to 70,000 s/f floors with 360-degree Manhattan views and 13-ft. 6” to 24-ft. ceilings. Three floors (17, 60 and 76) offer tenants access to outdoor terrace space. Consistent with the Silverstein organization’s commitment to sustainable design and energy efficiency, and following 7 and 4 WTC, 3 WTC will be a LEED-certified Gold office tower. “The continued resurgence of Lower Manhattan is a powerful demonstration of the resilience of New York City. We rose from tragedy bigger, bolder, stronger, and still open to the world. 3 WTC is the next chapter in that story,” said mayor Bill de Blasio. 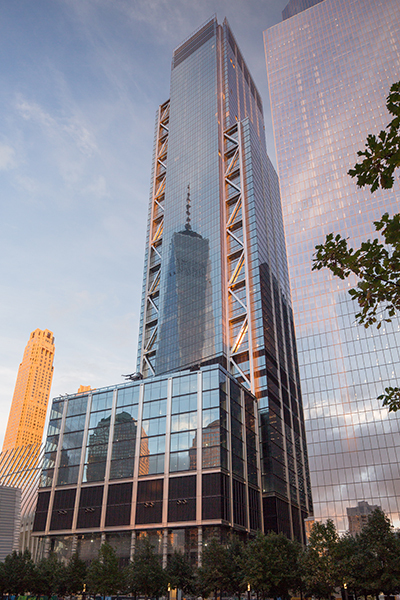 Anchored by media investment firm GroupM, 3 WTC recently signed leases with stock exchange company IEX and management consulting firm McKinsey & Co. 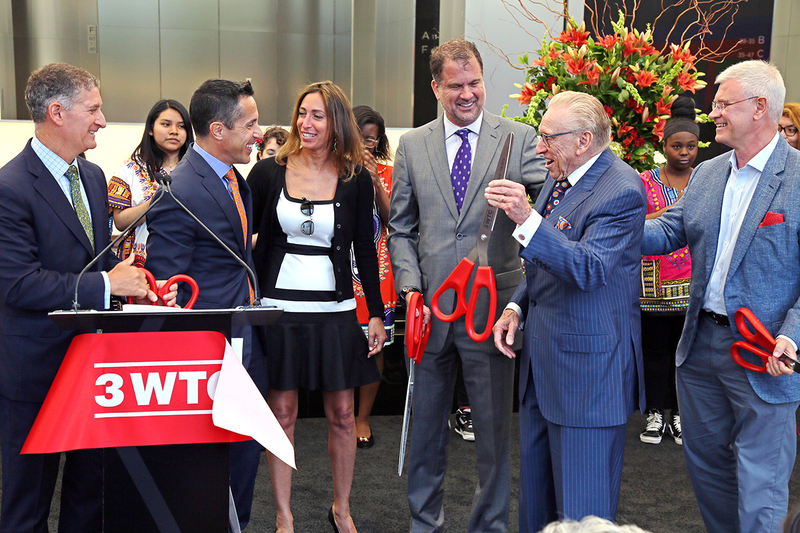 In addition, 3 WTC features over 216,000 square feet of retail space, spanning five floors. Located next to the WTC Transit Hub and above Westfield’s shops, 3 WTC is also connected underground to Brookfield Place. In total, the construction of 3 WTC involved the work of more than 4,000 union construction workers over the course of millions of hours. The building is expected to employ approximately 100 permanent and temporary workers to operate and maintain. According to a recent Downtown Alliance report, Lower Manhattan’s vacancy rate among commercial inventory remained below 10 percent for the fifth consecutive quarter. Last year marked one of the neighborhood’s most active seasons for commercial real estate activity, during which the Financial District topped all other submarkets in leasing transactions. Emphasizing the area’s attractiveness among incoming companies and private sector professionals, particularly a growing number of media companies, Downtown Manhattan now houses over 242,000 professionals, signaling the highest employment level in the neighborhood in over 15 years. Designed by Pritzker-prize winning architect Richard Rogers and his firm Rogers Stirk Harbor + Partners, 3 World Trade Center will enliven and seamlessly integrate into Downtown’s streetscape, with a major concentration of retail – both at the street-level and in underground pedestrian concourses that lead directly to 11 subway lines and the PATH trains. GroupM, the world’s leading media investment management group, signed a 20-year lease in December 2013 to occupy approximately 700,000 square feet on 13 floors at the base of the 80-story tower. McKinsey signed a lease earlier this year for 185,000 square feet and IEX signed a lease for 44,000 s/ft. The building is currently 38% leased. 3 World Trade Center is a model of transparency and sustainability. The tower consists of a reinforced concrete core with steel structure outside the core and is clad in an external structural steel frame. The building features floor to ceiling glass, and all four corners and each floor plate of the tower are column-free to create an open workspace environment – key for cutting-edge companies in brainpower driven businesses like technology, advertising and branding, as well as law and financial service firms. 3 World Trade Center will be a LEED-certified Gold office tower.